Is SXSW's Real Life Mario Kart As Amazing As You'd Imagined? Everyone who's played Mario Kart secretly wants it to be real. Sure, flinging turtle shells and banana peels at other cars will probably get you arrested, and while I once did go karting after eating some shrooms, I can't say it helped my speed. So I was exited to try real-life Mario Kart at SXSW. Here's what it's like. I'm here at SXSW to give a panel about car hacking, and when I saw that Pennzoil and Nintendo teamed up to bring a live-action Mario Kart to the event, my pants tightened in predictable and very understandable areas. Who hasn't wanted to have the Mario Kart experience made real? If you've played Mario Kart and that thought hasn't occurred to you, you may as well sign up to donate some organs, because you'd clearly not be needing them. The partnership between Nintendo and Pennzoil is interesting. It may be the only petroleum products company/video game company partnership in history, if you don't count that aborted teaming up of STP and Namco, when all those kids went to the hospital after trying to chug motor oil like Pac-Man. Pennzoil is releasing a new natural gas-derived motor oil (more on that soon) and they wanted to promote it in a big way. I think they managed. I spoke with Pennzoil's Chris Hayek, who told me that the idea came from Pennzoil's ad agency, and when they pitched it to Nintendo, they were very interested, since the new Mario Kart 8 for the Wii U is about to be released this summer. They only had around three to four months to get it all ready from the initial idea — not a hell of a lot of time. Even so, they did manage to get most of what they wanted in the game, losing only one key feature because it made safety-conscious lawyers wet themselves. I'll get to that feature in a moment. Here's the basic idea behind it: a karting track with electric karts, outfitted with cameras, RFID sensors, and real-time up-and-down data communication to a central server. When the karts' wheels pass over RFID-tagged decals on the track, information is relayed to the server and then back to the karts to affect the game. So, for example, if you run over a power-up decal that increases speed (like the traditional mushroom), then a signal is sent to that kart to increase the voltage to the motor, giving a burst of speed. Run over something negative, like a turtle shell, and voltage is cut, slowing you down. One of the power-ups references the anti-gravity feature in the New Mario Kart game, and when its run over, the video feed flips vertically, so people watching the big screen see an anti-gravity kind of effect. The driver, of course, doesn't see this. The planned power-up that was cancelled was the banana peel— the thought was that if you run over it, the steering loosens up dramatically for a moment. For safety concerns, this was killed, but I still think it would have been pretty fun. So, to allow for speed increases and decreases, the karts are set to a default middle setting of power. This initial setup at SXSW requires the driver to run over a series of power-ups to get the speed boost (which I found confusing— I thought they each had some independent effect). As a result, the overall effect was one of running a frustratingly slow kart, until you did get the speed power-up, which was quite exciting. Live-action Mario Kart establishes a really great baseline of technology, and has huge potential — but this first iteration is a little disappointing. This is not a dig at Nintendo or Pennzoil — they did an awful lot in a very short amount of time, and they had some huge safety restrictions hanging over their heads. Move it indoors, and use projections. I think these two methods could add a huge amount to the experience. By using an indoor track, there would be much more control over lighting, environment and the overall look. An array of overhead-mounted projectors pointing down on the track would replace the immobile decals currently used to display the various icons and elements of the game. As it stands now, the only way to see, say, a turtle shell is from a spectator's point of view. If a projector system was used, an actual animated shell could be projected on the track, and could either be targeted at a predetermined set of RFID tags on the track or, if we really wanted to get fancier, be tracked and identified with a digital vision system. With an actual overhead vision system, you could pick up a power-up that, say, gives you a shell, and then you could "launch" the shell with a trigger on the steering wheel. The launched shell would animate down the track, and, if the vision system detects a contact with another kart, that kart would be slowed or stopped accordingly. The issue here is the most common and cheap computer vision system usually employed for things like this is Microsoft's Kinect system. Which, of course, Nintendo probably won't want to use. Still, I suspect that they've got something that would work as well. Or maybe they can just really hide those Kinect sensors. Even if the projections did not use any digital vision system but rather stayed with a pre-placed RFID tags, you could still get much more dynamism in the race. The power-ups at the given locations could change, animate, or move from RFID tag to RFID tag. It would go a huge way to making the driver feel like they were in the game. Exploit bouncy-castle technology. One of the most exciting things about the SXSW setup were the wonderful hard-foam sculptures of the power-ups. The star, banana, and turtle shell all looked just like their in-game counterparts, and seeing them in the real world did a huge amount to draw people into the experience. Except, of course, they weren't actually in the game at all. Which is a shame. Luckily, there's a very accessible solution: inflatables. The powerful bouncy castle cabal in America has been producing inflatable fantastical objects for years. There's artists that work in this light, bouncy medium making custom inflatable objects and characters. Nintendo could use these huge inflatables to flesh out the environment of the track, and give it that trademark friendly-and-everything-has-eyes Nintendo look. Rich, saturated colors, bold shapes, all of it would help put the participant deeper into the game. Also, it would be fun if things like turtle shells or mushrooms or bananas or whatever could be physical inflatables like these. Perhaps they could be lowered from the ceiling, where they could make contact with a probe from the passing cars, triggering their use (and maybe then passing their representation off to the projection system). Or, hell, if you could fling an inflatable turtle shell at a player, impact would be harmless, but an RFID tag could still be triggered. Maybe there's safety issues there, but, come on, how bad could it be? Put the focus on the driver, not the spectators. The biggest issue with the system now is that the richest, most game-accurate experience is only available to those watching on the big video monitors. 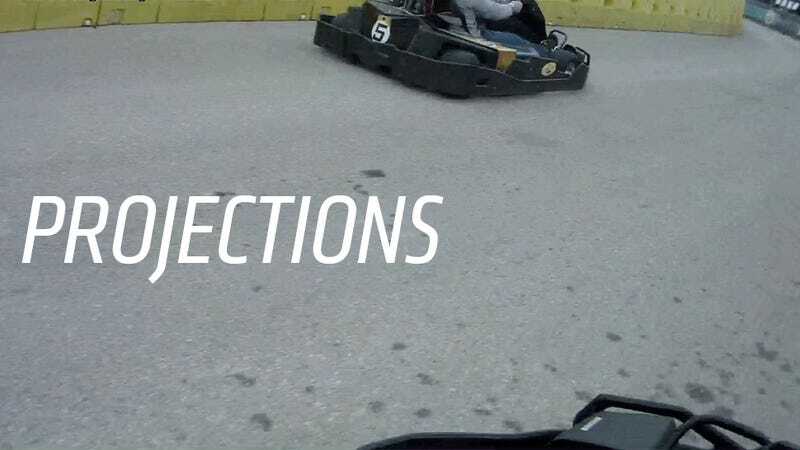 The in-kart experience isn't all that different than regular karting at the moment. But it doesn't have to be that way. The full experience should be available to the driver; that's what the game is, and has always, been about. With a bit of extra effort on the overall look and feel, gameplay mechanics, and a bit more technology, Live Action Mario Kart can go from a technically impressive but unfinished-feeling Beta test into a full-blown immersive experience that everyone would really love. I'm not knocking the Pennzoil-Nintendo team who pulled this off in a very short amount of time. I'm just hoping they will continue to develop this so it can become everything it could be and I wanted to offer the best advice.